Surprisingly, making your very own smoke grenade is pretty easy—and cheap. All you need is a saucepan or skillet, piezoelectric lighter, sugar and some potassium nitrate (easily available online and in most gardening stores). 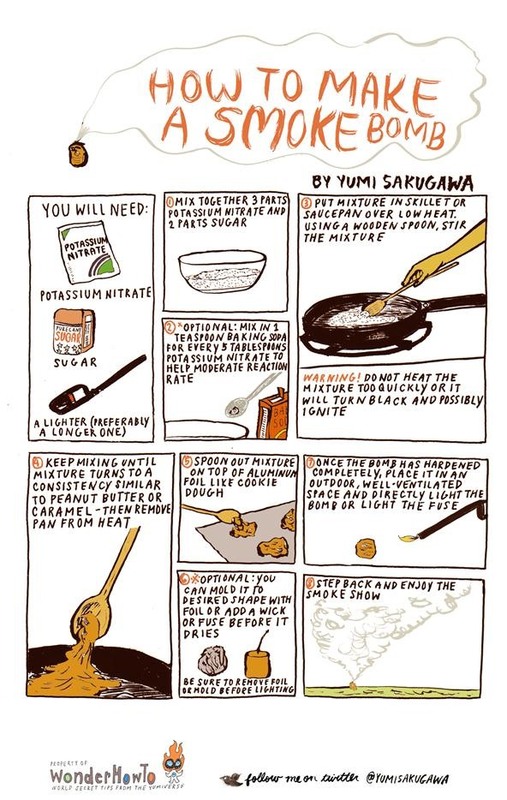 Simply heat the ingredients over low heat until they're mixed together into a caramel-like gooey consistency. Wait for a dollop of the mixture to harden and you've got yourself a homemade smoke bomb ready to use for your next scientific experiment. It's also great for cheap movie effects or the sheer amusement of setting something on fire and watching it smoke like crazy. Got other methods for creating a DIY smoke bomb? Share with us in the comments below! Yep. Powered dye works great for adding color. Also, I hear you can use baking powder to make the smoke pour out more steadily, but have never actually tried it myself. Very cool! Didn't know about the colored smoke trick. To prevent premature ignition, use a double boiler set up instead. just were can i get that potassium nitrate? you can easily get them at most gardening stores or order them online. Maybe try this or this? Basically the same thing, but looks like a lot of smoke.